School is out, graduations are over and the heat of summer is on. You’ve got your suntan lotion, a giant cooler ‘ you’re ready for a summer road trip. Or maybe you’re just putting up with the usual hours long commute in stop-and-go traffic, but with waves of heat bouncing off the asphalt. A few hours of prep now might save you from hours stuck on the side of the road, a big repair bill and a ruined vacation. 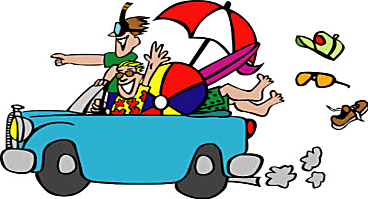 Whether you have longstanding travel plans, a last minute road trip in mind, or just sticking around town this summer, the California Office of Traffic Safety (OTS) reminds you to give some thought to your summer travel to ensure everyone arrives safely and can enjoy the trip. Plan, map and estimate the duration of your driving ahead of time and let others know your plans. You can estimate the cost of gas for your trip here. Expect to encounter roadwork, delays & detours – ‘Slow for the Cone Zone’ Check road conditions, including possible road closures by click here. Safety First and Always Buckle Up. Every Trip. Every Time. If you have a flat tire, engine problems or a fender bender, drive out of traffic lanes and off the highway if possible – freeway shoulders are not safe for repair work. Always plan ahead, use a Designated Sober Driver. If you see drunk or dangerous drivers, it is legal and encouraged for you to call 911. Clues can help motorists detect a drunk driver: excessive weaving/swerving, especially in and out of the lane; traveling at speeds much slower than the flow of traffic; braking erratically or stopping in the lane; sudden stops for signal lights and slow starts once they change; remaining at the signal lights after they turn green – asleep at the wheel; making wide turns and/or cutting the corner striking the curb. Parents, grandparents and caregivers, need to use the correct seat for young passengers and be sure the seat is installed properly. NHTSA and the Office of Traffic Safety recommend keeping infants, toddlers and older children in the car seat for as long as possible, as long as the child fits within the manufacturer’s height and weight requirements. Click here for assistance with proper car seat installation in advance of your trip. Remember that long trips can be particularly tough on your kids, especially in the heat – pack plenty of snacks and cold drinks for the road (consider freezing juice boxes or water bottles overnight). Use books, toys, DVDs and video games to keep children occupied and the driver focused. Keep children 12 and under in the back seat – it’s the safest place. Stopping along the drive gives everyone a chance to stretch and makes the trip easier. If you have a fussy baby, do not take them out of their car seat while driving to soothe or provide a bottle. If your child needs that level of attention, pull over in a safe place, such as a rest stop. Older children need to ride in a booster seat from about age four until a seat belt fits them correctly. Be sure to try the 5-Step Test at www.ots.ca.gov before graduating from a booster to a seat belt. Don’t text or talk on your cell phone while driving – even hands-free. If you need to make a call, check road or weather conditions or respond to a text, wait until you stop in safe place, such as a rest stop or parking lot. Don’t program your mobile GPS while you are driving. Either have a passenger do it or stop in a safe place. Share the driving with other passengers to avoid fatigue. Rest – driving while drowsy can be fatal. Even a 20 minute nap can do wonders. Schedule your trip to allow for frequent breaks. Take time to pull over at rest stops to stretch your legs and focus your head. Stop for food or beverages. Avoid eating while driving. Don’t fall into the trap of driving while angry – aggressive driving kills. Never leave a child unattended in a vehicle, even with the window slightly open. An outside temperature of 101 degrees can easily result in an interior temperature of 140 degrees. If you see a child unattended in a hot vehicle, call 911. EMS professionals are trained to determine if a child is in trouble. Place your cell phone, purse or other important item needed at your next stop on the floor in front of a child in the backseat. This triggers adults to see children when they open the rear door and reach for their belongings. Set your cell phone or Outlook reminder to be sure you dropped your child off at day care. Have a plan that if your child is late for daycare, you will be called within a few minutes. Always lock your car and ensure children do not have access to keys or remote entry devices. If a child is missing, check the pool first, and then your car or any other vehicles at your house, including car trunks. Teach your children that vehicles are never to be used as a play area.